Shows like Wind of Colorful Guizhou touring Australia and New Zealand represent a new pattern for cultural exchanges between China and the world. GUIDING, Guizhou - An ethnic dance unique to a remote Miao village has been off limits to outsiders for more than 1,000 years. The Miao drum festival moves to the beat of the ethnic group's past and present culture.Guzang Festival, the most ancient and spectacular Miao festival in Guizhou province, was celebrated from Nov 10 to Nov 12 in Leishan county's Taoyao Miao village. Horsetail embroidery is a specialty of the Miao and Shui ethnic groups in Guizhou province. 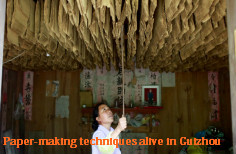 An exhibition showcases the cultures of Guizhou province's ethnic groups through their handicrafts. Wang Yangming (1472-1529), from Yuyao, Zhejiang province, was called Mr Yangming by scholars. Tusi is a title for tribal leaders recognized as imperial officials during the Yuan, Ming, and Qing dynasties. Villagers from the Yi ethnic group perform Cuotaijiin Hezhang county, Southwest China's Guizhou province, March 18, 2012. The Miao ethnic group's heroic epic King Yalu has been published in written form after being passed down orally for more than 2,500 years.